The thesis section of the website has been updated by adding theses with possibility of economic support. If you are interested, feel free to contact the people in the research group. 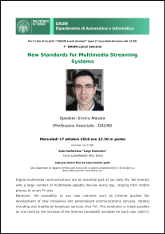 On Jun 4, 2018 at 4pm Leonardo defended his PhD work at Politecnico di Torino, titled “A New Modular E-Learning Platform Integrating an Enhanced Multimedia Experience”. He was awarded the PhD title: congratulations! We are glad to welcome Lohic as PhD student in our group. Congratulations! On Feb 21, 2018 at 12:30pm prof. Meo (Emeritus professor) will inaugurate the DAUIN seminar, which are held every third Wednesday of every month and are open to the public inside and outside the university. The title of the seminar is “Dimensions and Implications of the Informatics Revolution”. The seminar will be held in Italian at the Conference Room “Luigi Ciminiera”, in the Control and Computer Engineering Department, Corso Castelfidardo 34/D, Torino. On Feb 21, 2018 at 2:30pm in room 7 at the Politecnico di Torino, the seminar “Ethics and Robots” will be held (in Italian) by prof. Maurizio Balistreri. Please check here for more details. Wednesday, Dec 6, 2017 in Torino, at 10am the Internet Media Group will participate in the kick-off of PIC4SeR (Politecnico Interdepartmental Center for Service Robotics), in the AULA MAGNA of the Energy Center. Additional information available here. The thesis section of the website has been updated by adding five theses. Also, if you have ideas and willingness to work on topics somehow related to the proposed theses, feel free to contact the people in the group. 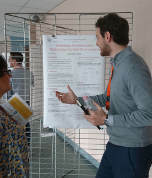 Congratulations to Leonardo who presented his PhD activity (poster here) of the last three years at Politecnico during the PhD Poster Day on Oct 19, 2017.